How to Prevent and Treat Eczema on Eyelid? Eczema is a difficult condition to deal with as it is, more so if it affects the eyelid. Because the skin of the eyelid is exceptionally thin and sensitive, this can pose a serious problem that should be given prompt attention. People who are looking for ways to treat eczema on eyelid usually suffer from swollen, wrinkled, itching or burning eyelids. Aside from the pain and discomfort, eyelid eczema can be very striking and difficult to hide. And given the fact that it is near the eye area, when seeking to treat eczema on eyelid, extra care should be taken to avoid complications. What Are the Most Common Triggers of Eyelid Eczema? So what are the underlying causes of eczema that primarily affects the eyelids, while mostly leaving the rest of the face unscathed? This may seem like a rather surprising discovery, but it was found out that among the most common triggers of eyelid eczema is the nail polish. Yes, you read it right – nail polish. This is because this product contains certain chemicals, which include formaldehyde that can set off an allergy reaction especially when in direct contact with the eyelid. Since the skin of the fingers are significantly thicker and more resilient, the chemicals from nail polish will not easily penetrate, which is of course not the same case with the eyelid. If you are allergic to formaldehyde or any of its relative, chances are, you will be more prone to eyelid eczema. They are chemicals from hand lotions, soaps and other products such as hair dyes, paints, glues, etc. Airborne droplets from spray products like air fresheners, hairspray and perfumes. Any product that contains any of the following: Quaternium 15, Methylchloroisothiazolinone and Imidiazolidynil urea. How to Treat Eczema on Eyelid? Identify The Underlying Cause. Like any other forms of eczema, the most important step to treat eczema on eyelid is to identify its trigger and avoid it. Use Mild Facial Wash. Use a gentle, hypoallergenic soap for your face. This is because rashes make skin more porous, thereby making it more prone to irritation. Apply A Bland Emollient. Applying a thin film of bland, gentle and all natural emollient such as pure jojoba oil is one of the most effective eyelid eczema treatments. Seek Professional Help. Given the sensitivity of the condition, it is important that you seek medical attention. Doctors will typically prescribe a short course of hypoallergenic and non-halogenated cortisone topical treatment. Do not apply any medication without medical supervision as any cortisone treatment can potentially damage the eyes. If you are unable to determine the cause of the allergy or irritation, an allergy testing can be used to identify the possible triggers. This will give you a better idea what to avoid in the future. 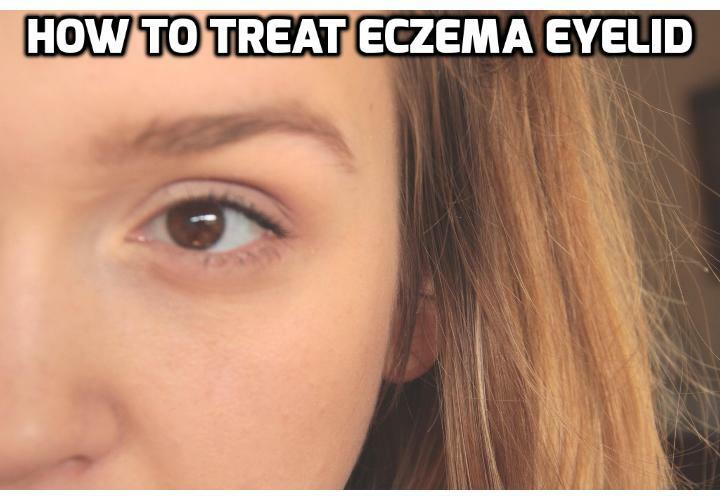 You can also watch a Video HERE to learn how to treat eczema on eyelid.